Sciatica is a painful condition that affects the lower back and the leg. 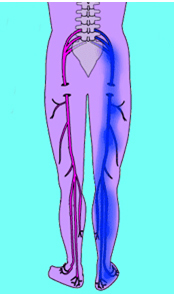 When the sciatic nerve becomes irritated, sciatica leads to pain that is typically felt on just one side of the body. Besides discomfort, sciatica is known to cause numbness in the affected regions of the body, as well as trouble with controlling the leg. When a person has sciatica, pain radiates from the lower back down to the thigh, extending downward to the back of the calf. In some cases, pain from sciatica flows upward as well, affecting the hip, and back down toward the foot. For many affected individuals, pain from sciatica is enough to impair the performance of everyday tasks. As the largest nerve in the human body, the sciatic nerve has great range, extending from the lumbar spinal cord down through the leg. The sciatic nerve is formed from the L5 and S1 nerve roots in the spinal canal and the union of these nerves becomes the sciatic nerve in the pelvis. The sciatic nerve continues through the pelvis into the buttock and back of the upper thigh to the back of the knee where it splits into nerves coursing into the calf. The most common of the causes of sciatica inflammation involves a herniated disc. It is important to understand here that each vertebral disc in the back is made up of a very tough outer layer of cartilage and a more elastic central area. As the age increases, these disks end up degenerating and becoming much thinner and weaker over time. Especially when you are putting a lot of pressure on this area for extended periods of time, this can result in causing cracks in the outer layers of the disks, thereby allowing the central mass to squeeze out. The bottom line is that one of the main causes of sciatica inflammation then is herniated discs in the lumber or sacral regions which put pressure on the sciatic nerve and result in causing pain and discomfort. The diagnosis of sciatica is based on history taking and physical examination. The investigation will help to pinpoint the irritated sciatic nerve. The physician will then carefully consider the results of the questions and physical investigation and may then decide that special tests are necessary. The main reason for these tests is to find out precisely what is causing your sciatica (if it is not already obvious), and whether an operation will help to cure it. Note that there are other tests being devised all the time, such as Needle Electromyography and Nerve Conduction Studies. Being aware of and avoiding activities or bodily movements that trigger or aggravate sciatica. Although sciatica is painful, some activity is better than none. Avoiding prolonged bed rest. Inactivity can make symptoms worse. A day or two of rest may be helpful, but avoid the temptation to lay in bed doing nothing else for a week. Non-Steroidal Anti-Inflammatory Drugs (NSAIDs) are helpful to reduce inflammation and sciatic nerve pain. NSAIDs include aspirin and ibuprofen. Acute or chronic sciatic nerve pain may require more aggressive types of non-surgical treatment. The doctor may combine therapies for maximum back and leg pain relief. If pain is severe, the doctor may prescribe a more potent NSAID. Chronic sciatica may require a muscle relaxant and/or anti-depressant medication. Certain anti-seizure and anti-depressant medications are effective in blocking pain messages sent to the brain. Some of these drugs may enhance the body's production of natural pain killers - endorphins. 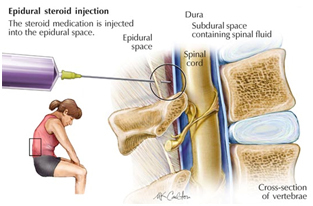 This type of spinal injection places a steroid (corticosteroid) medication near spinal nerve roots. Steroids reduce inflammation and can help to ease back and leg pain. An epidural steroid injection may provide pain relief for several months or longer. If the healthcare professional's diagnosis of your condition is that you have sciatica, they may then, if your condition is severe enough, decide that surgery is appropriate. Discectomy : - All or part of the problem disc is removed. Read More. Laminectomy/Laminotomy : -All or part of the lamina (part of the bony vertebra) is removed to relieve pressure on the sciatic nerve. Read More. Intradiscal Eletrothermoplasty : - A heated wire is inserted into the problem disc through a needle and used to destroy the tiny nerve fibres causing the sciatica. Radiofrequency Discal Nucleoplasty : - A radio frequency probe is inserted into the problem disc through a needle and highly-focused radio frequency field is used to vapourise some of the disc, reducing its size and thereby decompressing the disc to reduce the pressure on the sciatic nerve.